KVIS committees determine, plan and implement the work of the society. Each committee has a set of guidelines that provide the overall parameters of the group. You are warmly welcome to join any committee which interests you! This committee is concerned with the health of the Kenmore community in all its forms—mental, emotional, spiritual, and physical. The group works to help area residents learn about the many health-related opportunities available here while developing and presenting additional programs that will assist each person in obtaining and strengthening their good health. This committee’s focus is on each individual block in Kenmore. Through varied and interesting programs, the group strives to improve and showcase the positive qualities of each block while working to improve varied situations on each block. This committee also works to improve village safety through block representatives, street meetings and other initiatives. The committee prepares and distributes helpful informational folders to enable block clubs to organize and run successfully. This committee works to help create an attractive, vibrant and varied business district in Kenmore through relationships and dialogue creation between village businesses, commercial property owners and residents. The goal of the committee is to help each individual business prosper in Kenmore through increased sales and visibility while assisting commercial property owners to reduce vacancies and increase the desirability of each property and its corresponding lease rate. 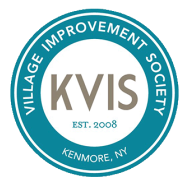 The committee communicates with the KVIS membership and our extensive media outreach to help create awareness of the many quality businesses here while working to attract new businesses to Kenmore. This committee proposes, plans and implements interesting events which will, where possible, support and not compete with activities already present in the village. The events planned add to a positive sense of community, are enriching and fun, with some events raising necessary funds for the KVIS. The goal of this Committee is to utilize the history of Kenmore to improve our vitality today through varied events and initiatives. Events and Initiatives: Trolley Suburb Initiative, Kenmore Remembers Book, Kenmore Historic Survey, Municipal Building on the National Register of Historic Places, All-America City Award Finalists. This committee is focused on the arts in Kenmore including graphic art, culinary art, dance and movement, writing, crafts and theater. The group works to help integrate the arts into community life in many varied and interesting ways. The important task of getting the word out about KVIS in the most effective and appealing way is the focus of this committee. The committee works on developing, maintaining and distributing KVIS publications, including informational and appealing flyers, brochures, posters, the KVIS Common Goal Newspaper, press releases, the KVIS website and varied social media sites. All public and municipal spaces (parks, gardens, buildings, sidewalks) are the focus of this committee. This group first started by taking a detailed audit of all public spaces in Kenmore and now observe these spaces continually to ensure that they continue to improve in visual and functional appeal. The Welcoming Committee creates an inviting atmosphere at KVIS meetings and supplies helpful information and guidance to those new to the KVIS. The committee creates thank yous, care packages, cards and more to KVIS supporters and helps strengthen the strong sense of camaraderie present in our community.